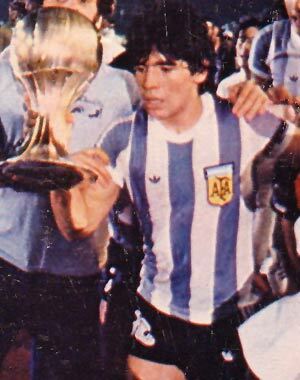 Diego Armando Maradona – born 30 October 1960 is an Argentine former football player. 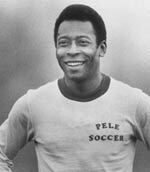 He is widely regarded as one of the greatest football players of all time. 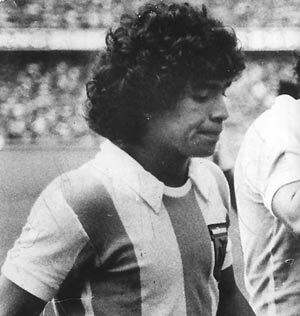 Over the course of his professional club career, Maradona played for Argentinos Juniors, Boca Juniors, Barcelona, Napoli, Sevilla and Newell’s Old Boys, setting world-record contract fees. In his international career, playing for Argentina, he earned 91 caps and scored 34 goals. He played in four FIFA World Cup tournaments, including the 1986 tournament, where he captained Argentina and led them to their victory over West Germany in the final, winning the Golden Ball award as the tournament’s best player. In that same tournament’s quarterfinal round, he scored both goals in a 2–1 victory over England that entered football history, though for two different reasons. The first goal was via an unpenalized handball known as the “Hand of God”, while the second goal was a remarkable 60 m (66 yds) effort that involved dribbling past six England players; it was voted “The Goal of the Century”. Maradona is considered one of the sport’s most controversial and newsworthy figures. He was suspended from football for 15 months in 1991 after failing a drug test, for cocaine, in Italy, and he was sent home from the 1994 World Cup in the USA after testing positive for ephedrine. After retiring from playing on his 37th birthday in 1997, he gained weight, suffered ill health and the effects of cocaine use. In 2005, a stomach stapling operation helped control his weight gain, and he overcame his cocaine addiction. His outspoken manners have sometimes put him at odds with journalists and sports executives. Although he had little managerial experience, he became head coach of the Argentina national team in November 2008, and held the job for eighteen months, until his contract expired after the 2010 World Cup.